I would have titled this "How Really to Sue an Imperial President," but blogger doesn't permit italics up there. And I mean Really! As in: distinctly different from the posturing gesture made by John Boehner this week. On Wednesday's show, Mark Levin spoke about John Boehner saying he was going to sue Obama for failing to faithfully execute the laws passed by Congress in violation of his oath of office. Mr. Levin said that Cong. Boehner likely would not be granted standing. That he wished it were different, but that the bar would be very hard to overcome. Upon hearing that, I recalled that in 1997, shortly after Pres. Bill Clinton signed the line item veto that Congress had passed, Sen. Robert Byrd had immediately filed suit to stop it. I did not recall the details, but it is a fact that shortly thereafter the line item veto was indeed overturned by the Supreme Court as unconstitutional. So the next day, while Mr. Levin was in his monologue about why the SCOTUS ruling about the appointments clause was a Trojan Horse, I called his show to ask him if there was not something to be learned in the line item veto case about how to sue the President successfully for his extra-constitutional legislating. The first clip was my laying the premise in order to get to the idea. He corrects a key mistaken assumption I had made, but he then patiently goes on to let me finally get my point across -- How was the line-item veto overturned and what can you learn from that? The second clip shows where it has dawned on Levin how my follow-up response to his answer was the exactly right way to move such a case forward. The third clip is where Levin summarized what he's been thinking and it's got him gleefully hoping he gets a chance to bring the case to trial. I must say it was very gratifying for me to have him respond so well once my idea hit home. Especially so because there was a moment there where I was afraid I was going to blow my chance to get my point across. And I am particularly grateful to Ed Bonderenka for extracting the clips from the full podcast so I could present them in this shortened form. Milbank just made up his anecdote about Gabriel "demanding" to know if the young woman was American. What Gabriel really said was, "I assume you're an American." After the studens says that she is, Gabriel says, "I'm glad you're here." She then goes on to make a point about how she wishes people would worry more about the government's response to the Benghazi attacks than how many peaceful Muslims there are in the world. Back? See, that didn't take long. Note John Nolte's bottom line. "The real question is: Where are the Washington Post fact checkers? Where are Milbank's editors? A major newspaper publishing this kind of smear is beyond bias; it's indecent." Indecent? That is understating the behavior by a long shot in my opinion. That's why I posted this as my first of many examples of Soviet style behavior in the Izvestia and Pravda's of our time and in this country. Readers are requested to send in additional examples of outright lying, dissembling and disingenuous reporting by the SSM. * Feel free to use my comment stream or my email. I intend to keep a record of them here under my label Agency of Lies and my new SSM label. *SSM is the acronym for Soviet-Style Media. Readers know that over the years my terms for what most still call MSM have evolved. IIRC it began with Lamestream Media, then the Orwellian Ministry of Truth and Minitrue, to Ministry of Lies, to Agency of Lies (AoL) to Soviet-Style Media. I was delighted before I darkly considered what higher courts are likely to next do. This feeling of sanity does not need to be short lived. Still, you understand that the war is not nearly won. What YOU have to say on the matter can affect 5 or more of those black robed pretenders if you so desire. Maybe one of you can figure out how to do it and then do it. Do not overlook the power of buzz. How can there remain any doubt that the GOPe is currently playing for the side that wants to sustain all recent violations of our Constitution's limits on governmental power? They are doing whatever it takes to keep the Prog agenda moving Forward. 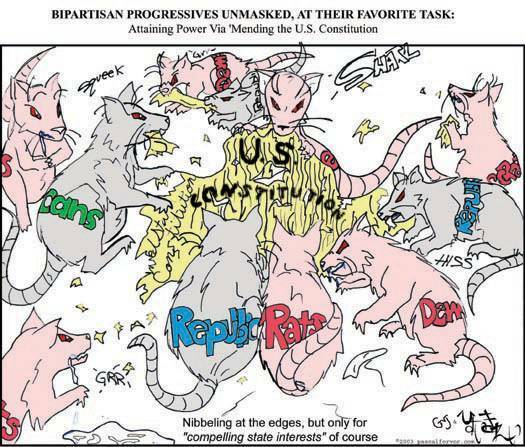 Provided is significant evidence that the GOPe plays a central role all or part of advancing the Progressive movement. Readers are provided examples on how to observe and assess new evidence and add it to the growing list on how real opposition to Leviathan is being not just marginalized, but steam-rolled. The GOPe appears to have dropped all its facade as the leadership of the "opposition party" with its efforts to keep Thad Cochran as U.S. Senator from Mississippi. Rumors eh? Seems realistic given today's politics (war by other means). No doubt he expects payback for this. And he was certainly not the first, and he is clearly was not breaking new ground. Only the latest and more open. Just last week we had another example. Who can be surprised at this point? It is simply par for the course when you understand what a kabuki theater postmodern American "adversarial" politics has become. Senate Minority Leader Mitch McConnell bragged at an event Tuesday night that it was the “biggest fundraiser ever in this building” — a feat considering the building is the National Republican Senatorial Committee. Look. None of us oldsters, who witnessed in our youth how constitutional conservatives railed against the "country club" Republicans, and who also know some older American history, should be surprised. The Progressive movement began in the GOP. Understand how the Progs engineered their spread to the Democrats? It was Prog Teddy Roosevelt's Bull Moose run that split the vote against sitting GOP President William Howard Taft in 1912 to give us disastrous and tyrannical Prog Dem President Woodrow Wilson. If the voters of Mississippi, including many Democrats who don't like Washington telling them what to do, lets Cochran pleas to Dem voters succeed at stealing the primary run-off from Chris McDaniel and legitimate Republican voters, then they are indeed the dunces that much of the world laughs at. However, the rest of America should not be too smug either. If Americans as a whole do not yet recognize how the Dems and the GOPe make up a combined party of power-mad Statist, then maybe it is time that the schemers succeed in erasing our liberty. We are either too stupid or willfully ignorant to put together the flaming evidence and understand how successful has been the subterfuge of this Statist juggernaut with their Leftist shock troops and Soviet-style media. The above cartoon was first published in 2002. The knibbling at the edges has gone on for so long, what is left of our constitution today? Who is gonna impeach the Constitution violator in chief? Haven't we let the SKUNCs win? As for you arrogant bastards at the top: you may not care that you will eventually answer to a Higher Authority, but those of us who cherish what it is you are destroying do care for those whose life you seek to make a living Hell. And so some of us pray that He makes you who know full well what you are doing to suffer for your hubris in this life while forgiving us our seeming inadequacies. The above headline was my reaction to these two Drudge headlines. Drudge really has a knack for pairing up headlines. I think provides strong evidence of double-think. At second of two community meetings last night. Me: As you can tell from my comments tonight, I really appreciated what you said last night. Bob: Thanks. The audience response was relieving. Sometimes you wonder "what's the use?" Too bad so few others got to speak on point. Me: Yes. Come to think of it, could you hear what Adam [in the audience facing the moderator and far to my right] said last night? He spoke at length on possible solutions. But without a mic it was hard to hear and I thought I heard him hit on some great points. Too bad he's not here tonight. Bob: Yeah, I like Adam. He's a good man. But I was too far behind and I couldn't hear his comments at all. Me: Too bad he wasn't as easy to hear as you are. I guess it didn't help that he was chewing gum. I'm sure it made it hard for him to project besides muffling his voice. Bob: [Laughs.] At least he didn't do it on the podium like President Obama did at the D-Day celebration. For someone with so many handlers you'd think they'd have helped keep him from making that mistake. Me: After so many "mistakes" you have to begin to think some of these things are deliberate. Bob: I'm sorry, I can't believe in conspiracies. Me: [snicker] What does conspiracy have to do with observing someone choosing repeatedly to behave boorishly for G-d know how many reasons? I could not help how quickly Bob connected a local man's gum-chewing to Obama's widely noticed display of it at Normandy suggested his disinterest or even contempt (as Head of State) for the event being commemorated. So it clearly was on his mind. My guess is that it had already occurred to him that Obama was maybe bored at the least, and possibly even contemptuous. But he didn't like where that thought took him, so he discarded it. His giving me such a quick and seemingly unrelated response suggests where he thought such thinking leads, and he engaged in double-think. "oh, it's a mistake that his handlers screwed up on." And he was also advising me, in a stern but friendly way, that it was best that I not think about it too much either. Okay. Okay. She said "leave" and not "Benghazi." But "at this point in time, what possible difference does it make?" Well, it's all rock and roll to her -- and SOP for her chief adviser, Slick. We have all heard the line "too big to fail" in regards economics. Now consider those words when wondering why Obama is effectively safe from impeachment, and -- well -- you know that house of cards metaphor for our financial situation? Think of that as regards the advanced decay of our republic. White House gives its blessing to Senate Democrats who want to campaign against its new global warming rules. P.S. : Speaking of cynicism. Who expect the GOPe will allow the GOP to exploit this news?